Valentine’s Day is a fun day to deliver sweet things to each other. 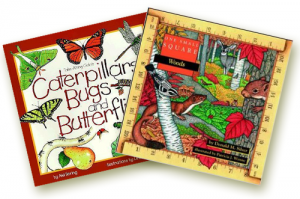 Here are some sweet things to do! 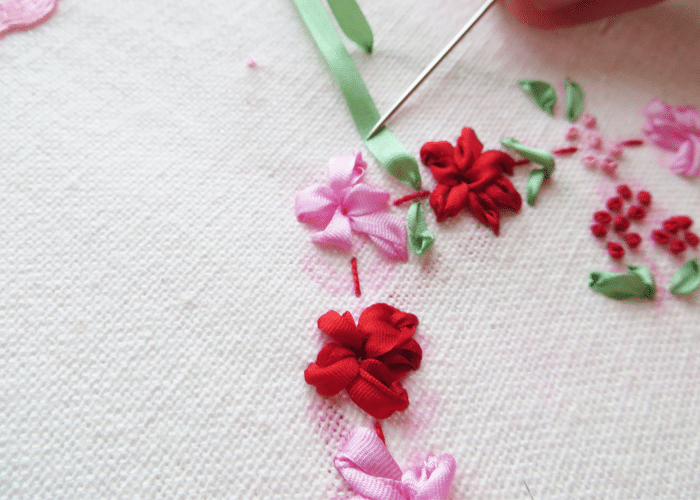 How about a lesson in silk ribbon embroidery? 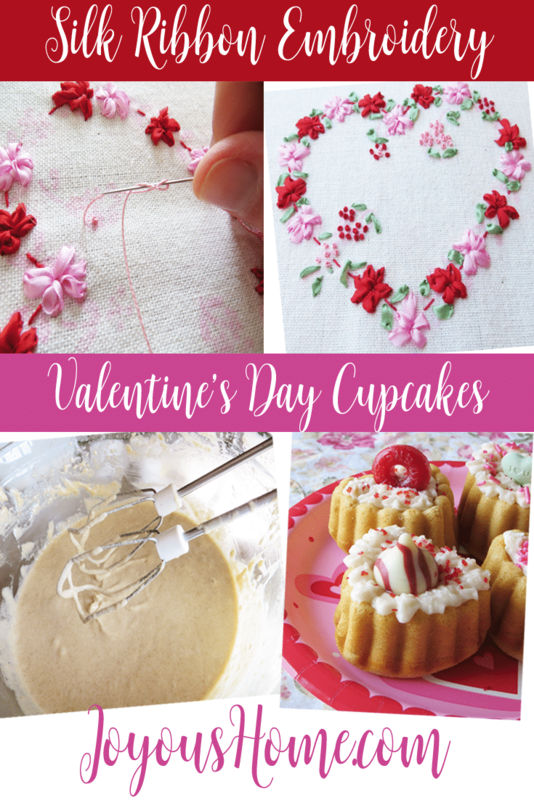 And you can’t sew without having some yummy cupcakes for Valentine’s Day, well, at least I think so. Cute little heart cakes that you can decorate any sweet way! 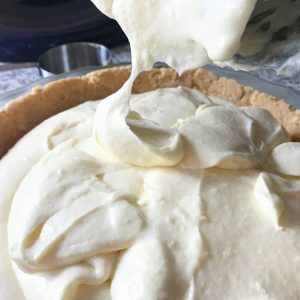 Combine the first 4 ingredients in and whisk or beat until light and fluffy. Add the dry ingredients and the 1 3/4 c. of milk. Beat in, but don’t over beat. 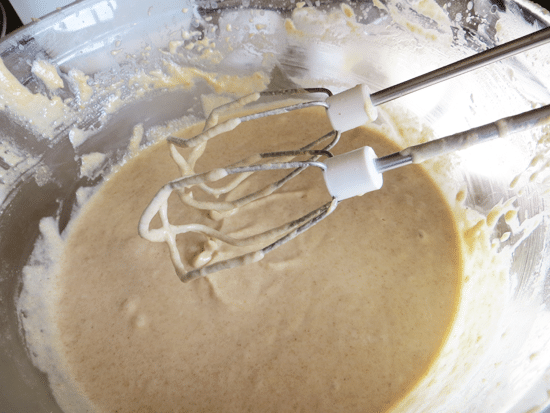 Your batter should be the consistency of a boxed mix. Whole wheat soaks up liquid quicker than white flour, so let your batter sit for 10 minutes then check the consistency. 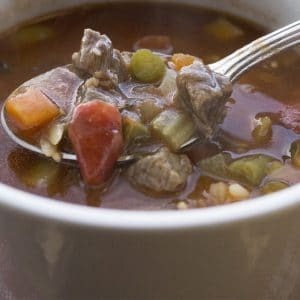 If it’s too thick, add another 1/4 c. of milk, beat and let sit for a few more minutes. Too little milk, and you’ll have little holes at the top of your cake. 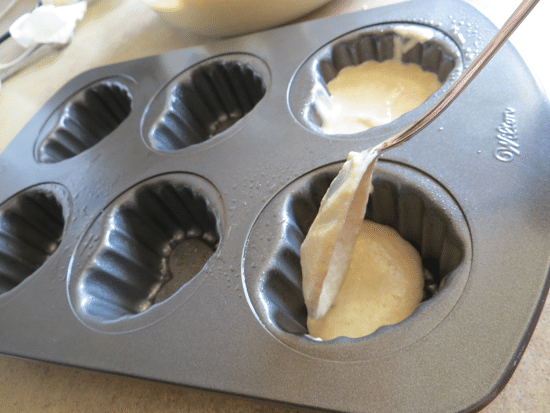 Spray your special pan and add batter until 2/3 full. Bake for 15-18 minutes or until they spring back. Oh boy, these were good! For those who don’t love whole wheat, honestly, you can’t tell. 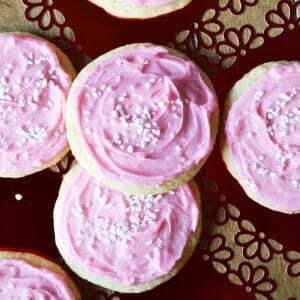 Add pink food coloring if desired. I used candy instead. I piped some icing around and on the tops. The cake is pretty sweet and doesn’t need a lot of frosting. 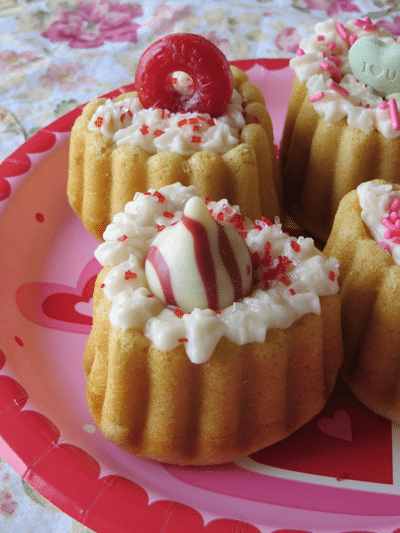 Makes 12-15 little cakes using a heart mold pan. This is our favorite white whole wheat cake recipe. It turns out very well. Try some cute cupcakes with it! 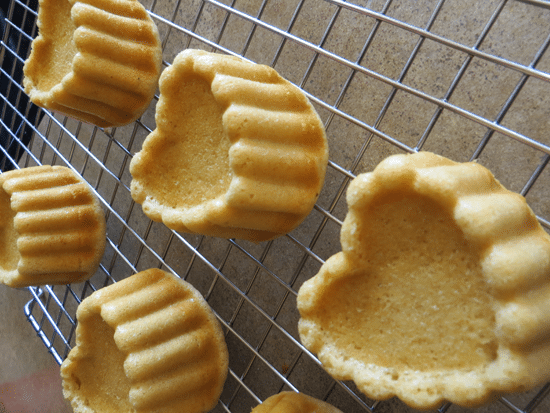 In a separate bowl, whisk together the baking powder, sea salt, and flour. Set aside. 1. 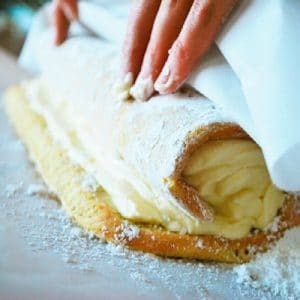 Combine the first 4 ingredients in and whisk or beat until light and fluffy. 2. Add the dry ingredients and the 1 3/4 c. of milk. Beat in, but don’t over beat. Your batter should be the consistency of a boxed mix. Whole wheat soaks up liquid quicker than white flour, so let your batter sit for 10 minutes then check the consistency. If it’s too thick, add another 1/4 c. of milk, beat and let sit for a few more minutes. Too little milk, and you’ll have little holes at the top of your cake. 3. Spray your special pan and add batter until 2/3 full. 4. Bake for 15-18 minutes or until they spring back. Oh boy, these were good! For those who don’t love whole wheat, honestly, you can’t tell. Decorate or give as a gift! This project is fairly simple. 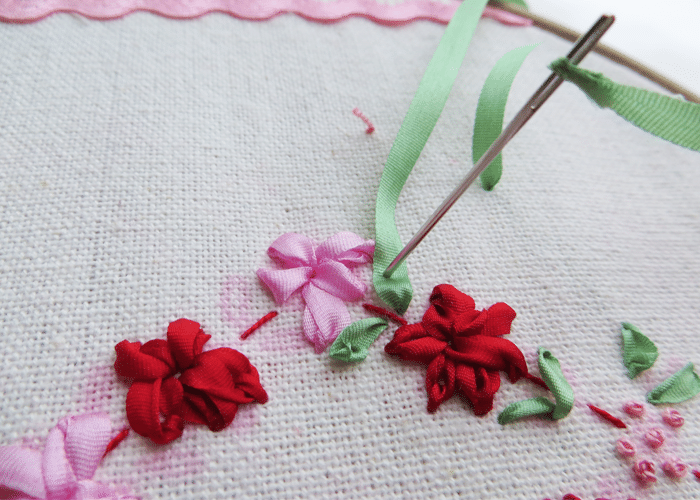 I know it looks detailed but silk ribbon embroidery is very forgiving! 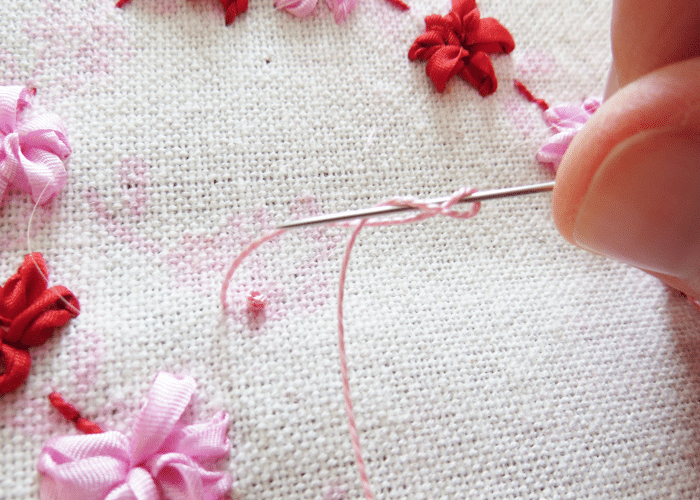 A few simple stitches can be learned to make beautiful things. 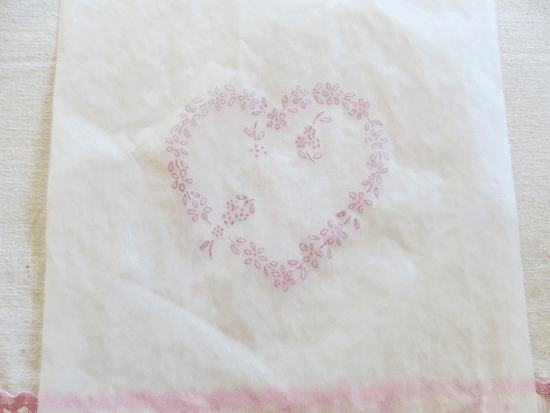 Something to embellish – I used a dish towel. You can do embroidery on blank cards (cardstock) also. You may download the template HERE. Personal use only – please do not share but please have your friends come by to download! Thank you! 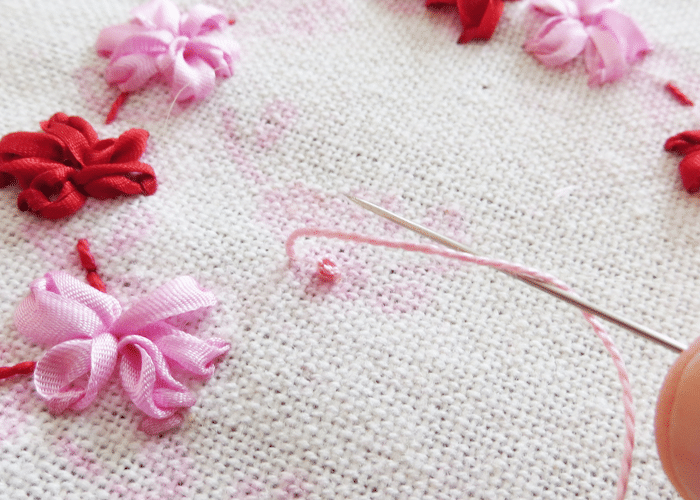 For each flower, I used: chain and petal stitches and colonial knots. 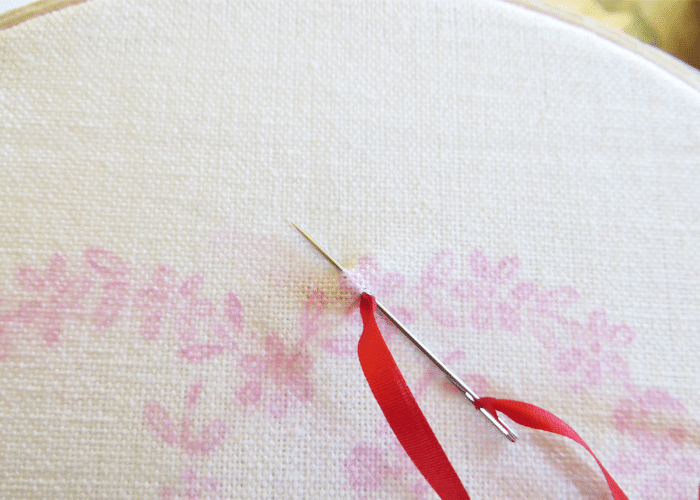 To start, make a knot at the end of the thread, and come down about 3″ from where you’ll start, leaving the knot on top. 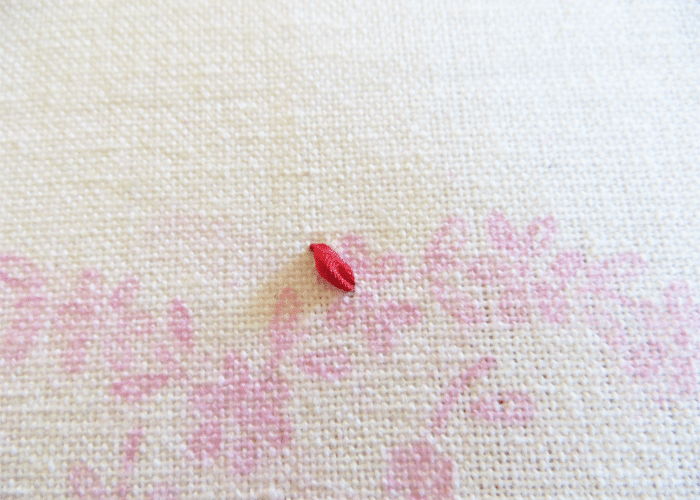 This is later cut and the thread is woven through the back threads. This prevents little knots all over the back. Just press down flat with the iron and lift. Do not move the iron or it will smear. Press, 20 seconds, lift. Make sure to get the whole pattern. Sometimes I tape mine in place, but don’t touch the iron to the tape. 2. 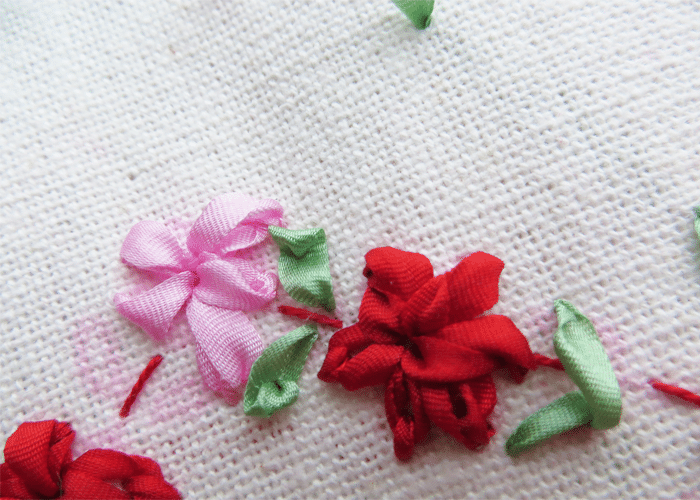 Outline in the between the flowers with a straight stitch using the pearl cotton. Come up through the back, take a stitch back down. Easy. 3. 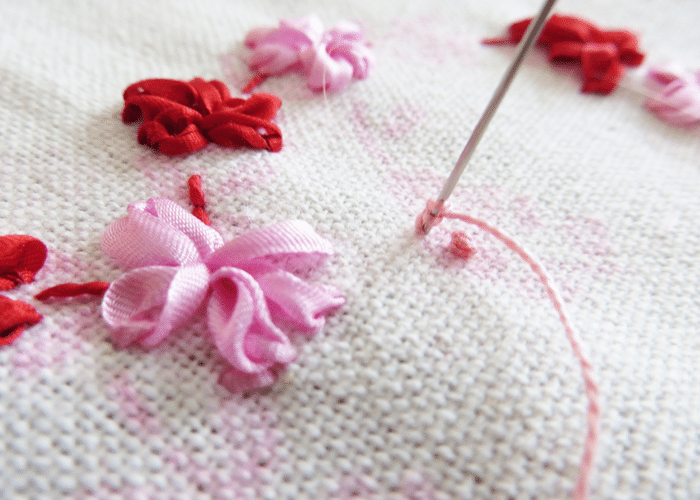 Knot the silk embroidery thread – It doesn’t matter what stitch you start with. I started with the chain. 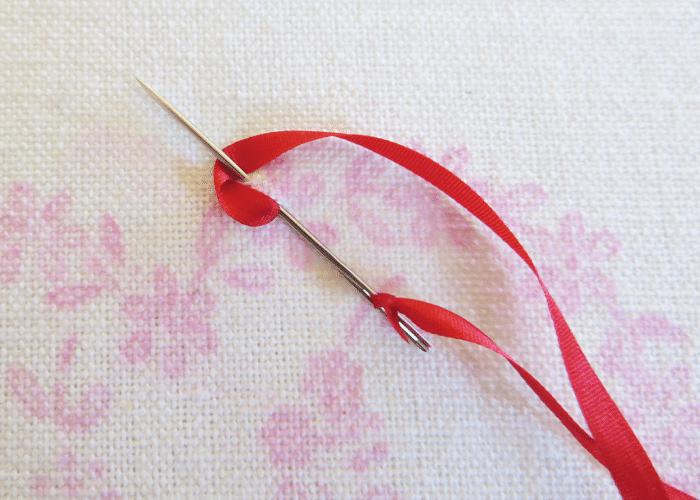 Secure a knot on the end of your needle by putting the thread through the needle, and going back in at the end – now pull the needle through and the knot will close. 3a. 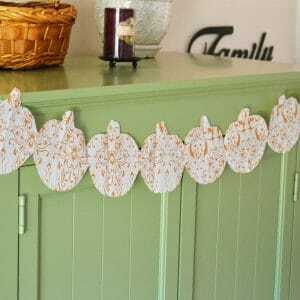 Chain Stitch – Come up through the back, take a stitch, but don’t pull through yet. (b)Wrap the ribbon flat around the tip, and then pull through. Come down at the top to secure. Make these in circles of 5 or 6 for each flower, alternating colors. 4. 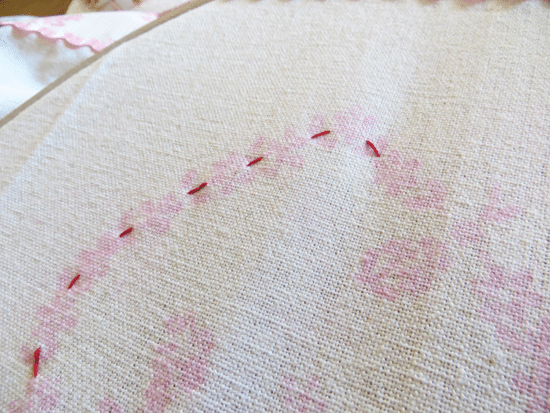 Petals – Come up, lay the ribbon flat, about 1/8″-1/4″ take a stitch down on top. Pull gently so a little curl forms at the end. Pretty and very easy! 5. 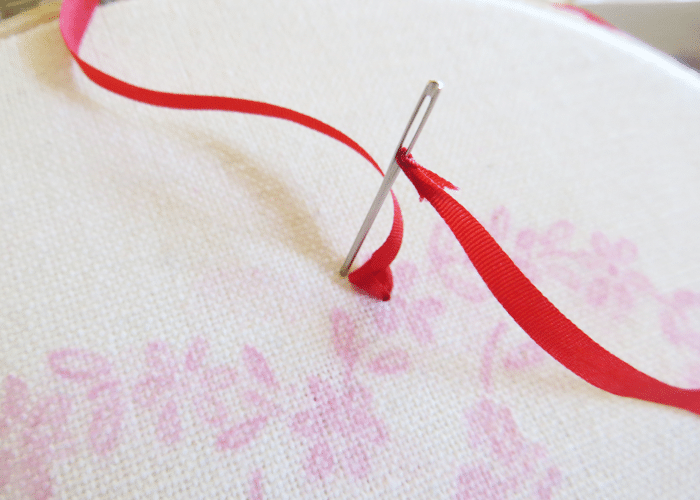 Colonial Knots – Come up, holding the thread in a slight curve, put the needle under the thread. Wrap once and still holding the thread, put the needle down close to where you came up, pull taut, and go down. Be careful not to pull through too quick. If this knots, you’ll need to pick it out, and it’s not fun. 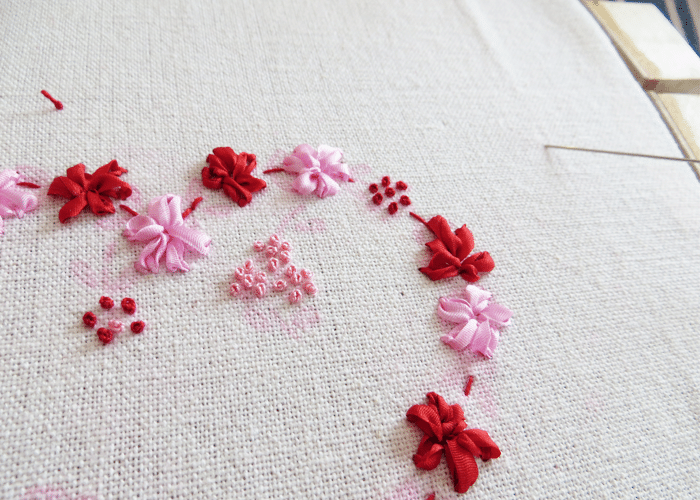 I added petals all in between, and around some of the colonial knots. This didn’t take long. 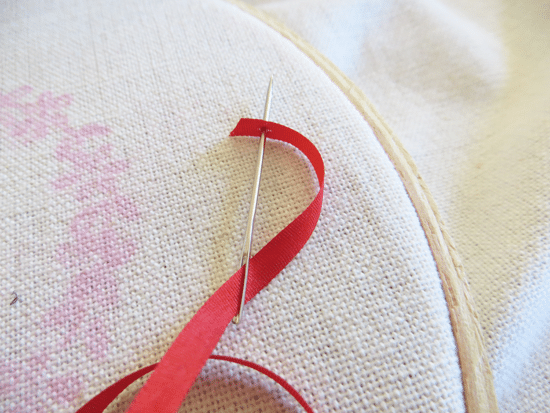 Ribbon embroidery is fast, and not hard at all. I hope you enjoy trying! 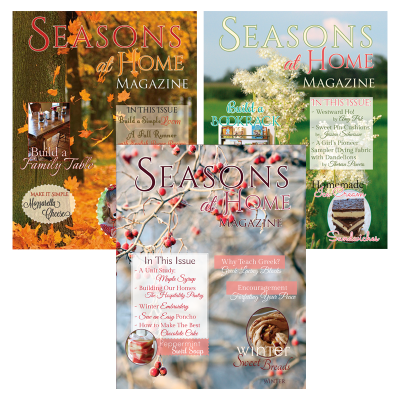 Previous Post: « Free Book Friday Winner Announcement | Homemaking Blog Hop Wednesday!